Happy New Year from Barney and all the rest of us! Just a quick post to let you know how things have been going and give a hearty "Happy New Year" to my online friends! The turn-signal switch. It's defective, and while it signals properly, it doesn't pass signal to both brake lights as it should - the right side lights up with the brake pedal, but the left does not. New switch needed. Replacing the steering wheel. The stupid aftermarket Grant wheel not only makes it hard to turn at low speeds, but does not operate the turn signal cancel cam or the horn. I've collected the parts and will do this when I replace the turn-signal switch. The rear springs. They're worn out and nearly flat, even when the car is on the lift. And the frame bushings are so worn out that the rear end "clunks" as it moves from side to side whilst turning corners - there's no rubber left in them. I have a new pair of springs, obtained from SASCO just before they shut down, and those will be going in as soon as possible. Post-break-in valve adjustment. I've never adjusted valves before, so this will be a learning experience! Reconnecting the heater. The whole heating system has been rebuilt; I just need to reconnect the hoses and fill the system. The doors. Both doors need new rubber and window seals, as well as interior hardware. I replaced the driver's side window regulator last year with a used part from eBay, but the gearbox clutch is weak and the window vibrates down as you drive. I have a new vent window for the driver's side to replace the munged one that's there, as well as new cat-whiskers, NOS door handles and door locks that've been re-keyed, all waiting to go in. I'll probably need a new set of side-view mirrors as well. Headliner & windscreen seals. My headliner is a homebrew thing that droops horribly, and I've found that the windshield seal is leaky in one place - a small dribble of water has made its way down the inside from the header. The backlight rubber seal is cracking badly in the corners as well. These two things will have to be addressed together, since replacing the headliner requires pulling both windscreens. So don't think that just because Barney's back on the road, there'll be any end to this blog - I've still got plenty to do, and I'll be writing about every bit of it! Now, as to the photo that heads this post: today I packed my wife and son into Barney for the first time, and we tripped on down to the 101 Cafe, a classic diner / drive-in on Highway 101 in downtown Oceanside, California. We had lunch and came back home, but it was fun parking the Lark in front of this iconic location and watching folks stare and point as we ate :) There were plenty of classics on the road today, and while at the 101 we saw a '69 Cougar convertible, a '63 Bel Air convertible, a '67 Fairlane 4-door, a '65 Austin-Healey and several nice old Harleys. It was a good Studebaker day! Unfortunately, I forgot to get a pic of Barney in front of the restaurant, but we'll get it next time. Thanks to all of you who've written and commented on my posts this year - I appreciate each of your questions and encouragements. Happy 2010 - see you next year! Don't forget the headlight wires. Now that Barney's home, I've got a few loose ends to clean up. I decided to begin yesterday by replacing some of the only remaining original wiring in the car - the cables that lead to the headlamp and front parking lamp assemblies. the availability of factory-fresh original parts. In this case, I was able to order NOS parking lamp and headlamp cable assemblies (still in their factory parts envelopes!) from Studebaker International. This is cool! The headlamp cables have all the correct molded plugs and such that aftermarket pieces (if they were available) would never include. Nobody ever thinks of headlight cables as needing replacement, but they are some of the most exposed wiring on the car. They're right out in front, where the rushing air and moisture is rammed at them; they corrode, they vibrate, and generally deteriorate until, one night in the dark, you find yourself with a circuit-breaker tripping and no light to drive home by. Not a great situation to be in. Since my car is a '63, this will be a rather specific tutorial, but generally you'll find things similar on any car. The first thing I did was to remove the aluminum trim that surrounds the headlamp and turn signals; these are held on with 4 #8 screws; two at the very top and two adjacent to the parking lights. You might find these screws to be pretty rusty (I did), so have some spares on hand to replace them with. Once the trim is off, you'll be able to remove the parking light lens and headlamps. The lamps are held into their buckets with chrome-plated steel rings that are attached to the buckets with 3 small machine screws. The rings are spot-welded together, and often over time these welds come loose (mine had). You can still use them; just be careful not to bend them out of shape while you're removing them. With the retaining rings off, the headlights just fall out into your hand! You can unplug them and, assuming they're still good, set them aside. At this point you can see the old wiring - 46 years old, in my case. And there's no doubt they needed to be replaced: as you can see in the shot to the left, several of the wires' insulation had cracked and was pulling apart to expose the wiring. This is a short or fire in the making! Not to mention the corrosion on the old sockets which can make for dim lighting and more stress on the wiring system and alternator. The headlight wires are fed into a hole between the buckets, with a conical molded rubber plug that fits in the hole to keep them from rubbing against the metal. This means that the cable must be fed up from the front of the car, not from the engine compartment down. Also, the headlamp harness's ground wire was riveted to the headlight support at the factory; I bent the connector back and forth to break off the wire, figuring I would use this hole for a screw that would hold the new ground wire. Interestingly, there is no provision for the wires to get into the headlamp buckets except by running between the inner and outer buckets, pinching them in place. So I had to remove the outer buckets. These are the adjustable, backless cones that the headlight bulbs sit in. They are held on by two adjuster screws and 1 spring, located at the bottom of the assembly. Loosen the screws and the buckets slide out; disconnect them from the spring and set them aside. Now you can take out the inner bucket from the inboard headlight - they just sit in their holes - and reach through to feed the new cable's harness connector up through the hole in the radiator brace. The cable's new plug fit neatly in the hole provided; a wide flat-bladed screwdriver is useful in coaxing it into its new home. I knew I'd need to feed the wire for the new turn signal up to the engine compartment too, so while the inner bucket was out I removed the very rusty screws that held in the very rusty parking lamp assembly and pulled it out. The new parking lamp holder has the weatherstripping for the lens pre-installed, so the only things to do are to pull the wire through and put the two screws back in. All done! After that, installation (as they say) is the reverse of removal. Put the inner and outer buckets back in. Take care when routing the new cables behind the outer buckets, so as not to pinch the insulation - space is limited here. Remember to squeeze some dielectric grease into the connectors before attaching the headlamp bulbs - this will seal the connections against water and prevent corrosion. Screw the headlamp rings back in, taking care to locate the molded bar on the bulbs into the notch in the bucket - this ensures that the bulbs are pointing in the correct direction. Finally, I used a sheet-metal screw with a shouldered head to hold the headlight harness' ground wire to the headlamp support. I found a good-sized one in my bin - looks like a #14 thread. You can see the fruits of my labors above, with one headlight re-installed. You can see how the cables are routed behind the outer buckets, and can also see the ground wire held to the support with its new sheet-metal screw. Home at last, home at last! Woo hoo! After a couple days of clock-watching, today was the day - Barney came home about 20 minutes ago! Yesterday I picked him up from the brake shop and ran him a couple of miles cross-town to Tri-City Transmission in Vista for a throttle-pressure adjustment, but he wasn't ready by afternoon so I made arrangements with Kurt to get him today after picking my son Reed up from school. We got to Kurt's around 3PM. He said he'd had Barney out on the road and he was driving really well; the only problem was that the kickdown valve seemed a little sticky (after all, it's been nearly a year-and-a-half since he finished the transmission for me) but that it would work itself out with use. While at the shop, Kurt introduced me to Ken, who was in with his cherry-red 1929 Model A roadster, and said that Ken was a fellow Stude owner. Turns out he has a '64 Daytona hardtop with a 289. We chatted for a while and I told him about the local chapter and website - hopefully he'll check us out. So I fired Barney up and proceeded out onto Santa Fe Avenue, northbound. 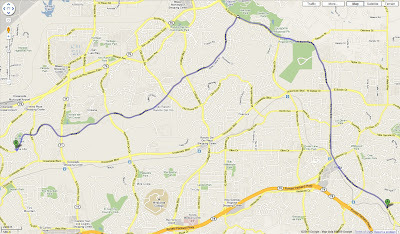 I took the long way home to avoid as many stoplights as possible - click on the map above to get a good view of our route. It took about 30 minutes for the 11-mile trip, but it was a breeze the whole way! The temp gage was working (maybe it just needs to be used, too) and never registered over halfway on the range, and the engine and trans were working together like Rowan and Martin. The only worry I had on the way home was about fuel - there wasn't a lot of gas in the tank to begin with; only about 3 gallons, and the two shops had been out road-testing the car a few times. But we made it home with no problems, with my wife and son serving as a "chase" vehicle, behind me the whole way. There's still a bug or two to work out - one stop light isn't lighting, and I really have to get the new rear springs in (the rebuilt front end is very quiet, but the worn out rear slams like a WWF wrestler). But he's on the road, and running well, and the hardest part of the battle is over (I hope). Now to have some fun! I picked up Barney from Vista Brake today and took him cross-town to Tri-City Transmission to get the throttle pressure rod adjusted. It was only a 2-mile drive, but he did great! The new brakes feel fantastic, and everything's running great. Still a few kinks to iron out - it feels like the vacuum advance isn't advancing correctly when I come on the throttle, and he still smells rich - and my temp gage still isn't registering - but overall it went well. Sorry, no pics - it was a rushed day - but I'll get some tomorrow. Wish me luck! One of the most mystery-cloaked operations in all of Stude-dom is the bellhousing dial-in. Known to make grown men shiver and quake with just the thought of doing it, this must-do strikes fear into the heart of even the bravest. Well, maybe it's not that bad. But it certainly is something no one looks forward to, no matter how steeped in Studebakers they may be. And it's something that's unique to Studebakers - you don't have to do this with an old Ford or Chevy, so if you're new to Studes it's essential that you know about this. So what is a bellhousing dial-in, and why is it needed? 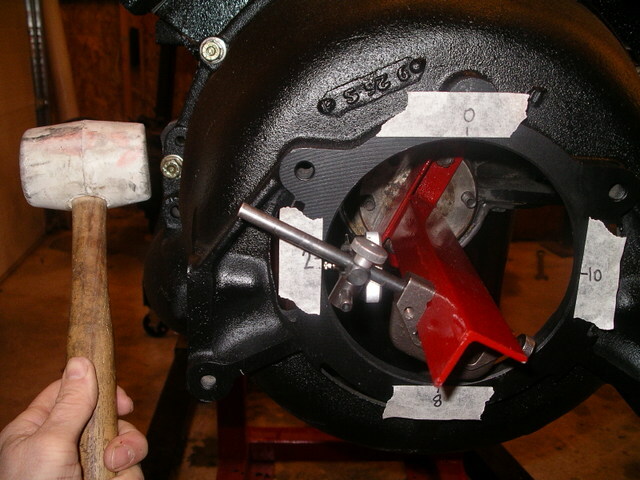 Long and short of it is that Studebaker's bolt-on bellhousings need to be aligned to the crankshaft center-line so that the crank and transmission input shafts are on the same plane. This keeps the torque converter (or flex plate, or clutch) from self-destructing as it revolves. Instructions are given in the shop manual, but nobody seems to really understand 'em. SDC member Allan Anderson recently photographed and described this procedure. Bob Johnstone has archived it on his website for all posterity (or at least until the Chinese take over the Internet and outlaw all things Studebaker). Check it out and make a bookmark - if you ever have to change out a bellhousing, this is an invaluable reference. Another reason I love Studebakers. One comment you always seem to get when people find out you own a Studebaker is "Boy! I bet parts are hard to get!" But reality is exactly the opposite -- Studes have one of the best supplies of NOS and reproduced parts of any American carmaker. Sure, there are soft trim items and model-specific bits that can be hard to come by (I'm still looking for an NOS right backup light lens for Barney, in case you have one! ), but by-and-large, it's less hassle getting parts for my Lark than for, say, a '62 Grand Prix, a '64 Falcon or a '66 Ambassador Classic. Case in point: after my recent re-wiring job, it dawned on me that the only bits of wire in the car that were still original were the headlight and front turn signal leads. So I opened my trusty Studebaker International catalog and found both headlight leads and front indicator assemblies (the entire lamp bucket with attached leads). Popped in my credit card and 7 days later, the mailman delivered, fresh in the factory parts envelopes, NOS parts for everything I'd ordered. This isn't an isolated occurrence, either - I've ordered and received many NOS parts from Stude vendors in the last three years. Now, I ask you, what other marque has that kind of original parts availability? By contrast, the last OEM part I was able to get for my '67 Pontiac LeMans was the driver's door mirror, which I ordered through my local Pontiac dealer's parts department. And it was crappy - the molds were so old and degraded that I couldn't drive the car over 30 MPH without the mirror flopping over to point at the pavement. So if questions about parts availability is keeping you from buying a Studebaker - don't worry. Somewhere, what you need is out there, and more than likely still in a factory package. Studebaker Swap, a forum-based place to post wants and items for sale. The Studebaker Parts Swap Page, a bulletin-board swap spot that's been up for a long while. The parts swap boards of Sonny's Racing Studebakers! forum, a cool site dedicated to Studebaker performance. If you've got another place you like, let me know and I'll add it here! What's better than a woman who likes Studebakers? A woman who isn't afraid to get under the hood and wrench on a Studebaker! Meet Los Angeles' Kristin Martin, who goes by the moniker "Grease Girl". She's filled her blog with all sorts of photos, stories and "how-tos" centered around her 1955 Studebaker Commander, pictured above. It's a fun read, and there are plenty of pics and videos as she gets in, around and under her car, and also visits various classic car-related venues and activities around SoCal. Remember, the future of our hobby is out there - we just have to figure out a way to recruit them! Grease Girl and others like her go a long way toward showing the young'uns that an old car can be a lot of fun. Check out her site and drop her a note of thanks if you like what you see.